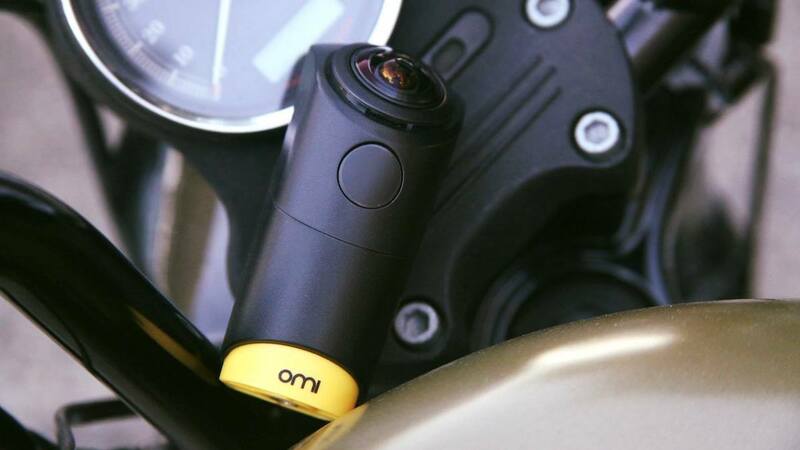 The OmiCam features a 240° fish-eye lens – meaning that it captures a full panorama around the camera and three-quarters of a sphere above it (and intelligently adds a logo in the dead space that the lens cannot capture). Content can then be shared directly through the Omi Studio app (for iOS and Android) or edited (including soundtrack and text) and shared through an application for your Windows or Mac computer. The short sample video below shows the image quality, even in with difficult light/dark lighting contrast… all while attached to the OmiCam founder who is struggling up a cliff. Designed for outdoor enthusiasts, OmiCam is splash-resistant, lightweight, and is easily attached to helmets, backpacks, and more with the different connectors and clips included with the unit. The battery life is impressive – nearly 15 hours when using the LifeLog feature, discussed below. Normal use still provides decent battery life, approximately 2.5 hours, but only if used without linking to a smartphone as a viewfinder, editor or live streaming connection. The unique LifeLog feature sets the OmiCam to record a five second video every three minutes (of course, the duration can be adjusted). The LifeLog algorithm claims to use the OmiCam’s sensors to capture the most exciting moments, allowing the user to focus on the adventure at hand… while having an immersive virtual reality record to re-experience later.